Meat. It’s delicious. I love it. I don’t, however, love how much of the world’s meat is managed. Anyone who has seen such programmes as “Food Inc.” will understand the impact that intensive farming of animals for meat has on the lives of the animals, the quality of the meat produced and on the environment. This is not the kind of meat I want to eat. One aspect of self-sufficient life that I am most looking forward to is the opportunity to rear our own meat for the table. Our animals will live happy lives, roaming open pastures and foraging for food. Their endings will be swift and stress free after which, out of respect for the animal, ever single scrap of the carcass will be put to good use. As yet we’re not quite in a position to keep animals. We need to sort out some barn space and build a chicken run. Winter in Lithuania is bitterly cold and animals need to be kept indoors for most of the winter months. I have never kept animals before and have so much to learn about how to keep them nourished, happy and contented. Add to that the fact that it’s my own first winter here – I need to figure out how to manage for myself in these temperatures before I take on sub-zero animal husbandry. While we must, for now, continue to source our meat elsewhere I am still keen to get my schooling underway. We prefer to eat only organic, free range meat and so we decided to buy a pig from a nearby organic farm and butcher it ourselves. In Lithuania you do not need any special license to slaughter animals for your own personal consumption. However, while we’re ready to roll up our sleeves, neither my husband or I has enough experience to humanely slaughter and process a fully grown pig. We found a local man, Tomas, with over 30 years experience processing pigs who agreed to take on the job. The pig we’d sourced was quite large – about 120 kg – which was far more than we needed for the two of us. Half of that would fill our freezer and keep us in meat for many months. We asked around and one of our friends, Donatas, agreed to take the other half of the pig. On the morning of the slaughter Arūnas and Donatas met with Tomas at the farm where the pig had lived its full and happy life. The boys gently coaxed the pig to a quiet corner where it met a swift and stress free ending. Tomas then set to work, expertly cleaning the animal, inside and out. The local method for dehairing pigs is to burn the hair with a high temperature gas flame and then scrape off the blackened hair. This process is repeated a number of times before plunging the pig into hot water to clean it thoroughly. A portion of the belly was deftly removed to allow for disembowelment and removal of the precious organs. Unfortunately the blood was lost – I would have liked to use this to make black pudding. However, all else was saved. The organs were shared equally amongst Arūnas and Donatas while Tomas took the bowel for use in sausage making. About two hours after he’d left the house Arūnas arrived back with our half of the carcass for me to butcher. I was waiting, knives in hand, ready to get stuck in. I always buy my fish whole and am well-practiced at filleting them. I also butcher chickens on a regular basis and consider my knife skills quite proficient. I had attended the “Pig in a day” course at Ballymaloe cookery school a while back and felt I was well prepared for the challenge ahead. Being faced with a 5 kg salmon or a 60 kg side of pig are not quite in the same league, though. I stared at it for quite some time, pondering where to make my first incision. I walked up one side, down the other, then flipped it over. I did this several times before calling on Donatas, who butchers his own pig every year, for some advice. There’s no right or wrong way to butcher an animal – it really depends on which cuts of meat you wish to obtain. Popular cuts vary from country to country. The loin pork chop that would be ubiquitous in Ireland is not very popular here in Lithuania. It is very common, however, to remove the loin in its entirety for smoking. Roasts with crackling skin are also not common here. Instead, the skin and fat are removed together for salting or smoking and are used as flavouring in cooking and sausages. 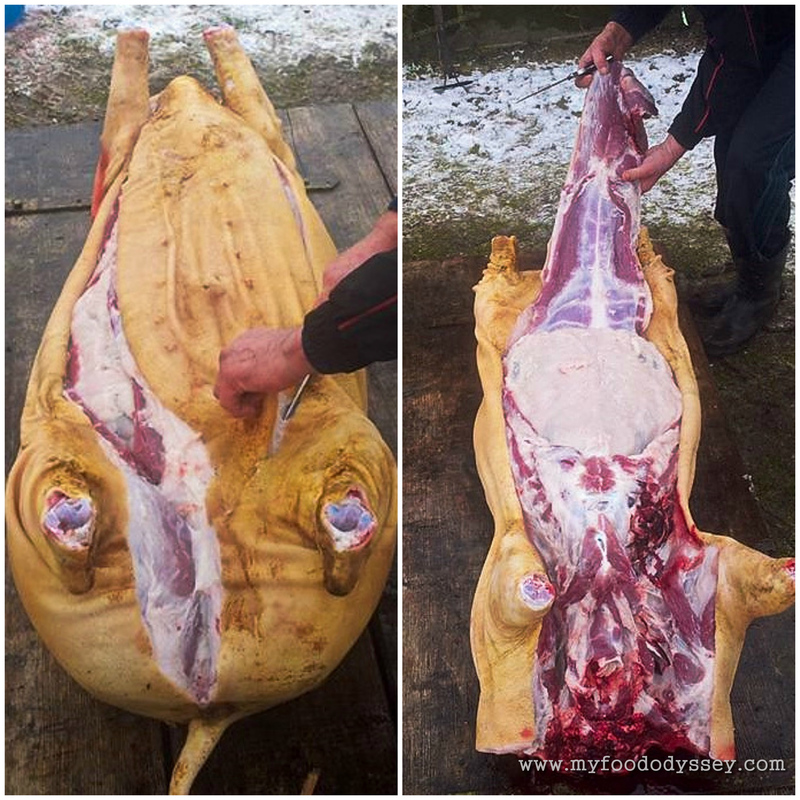 Thus, Donatas’s advice was to start by removing the skin and fat from the back to access the loin. This I did quite dexterously, despite my inexperience. My practise with the chickens came into play as I nimbly removed the loin and the fillet with hardly a nick out of either. I did, in my impatience and exhaustion from hauling a 60 kg carcass, accidentally cut off the top of the fillet when I removed a section of shoulder to allow for greater access to the loin. I’m not too fussed – there’s a meal in the remainder of the fillet as it is. It took me two days to fully complete my butchery of the pig. 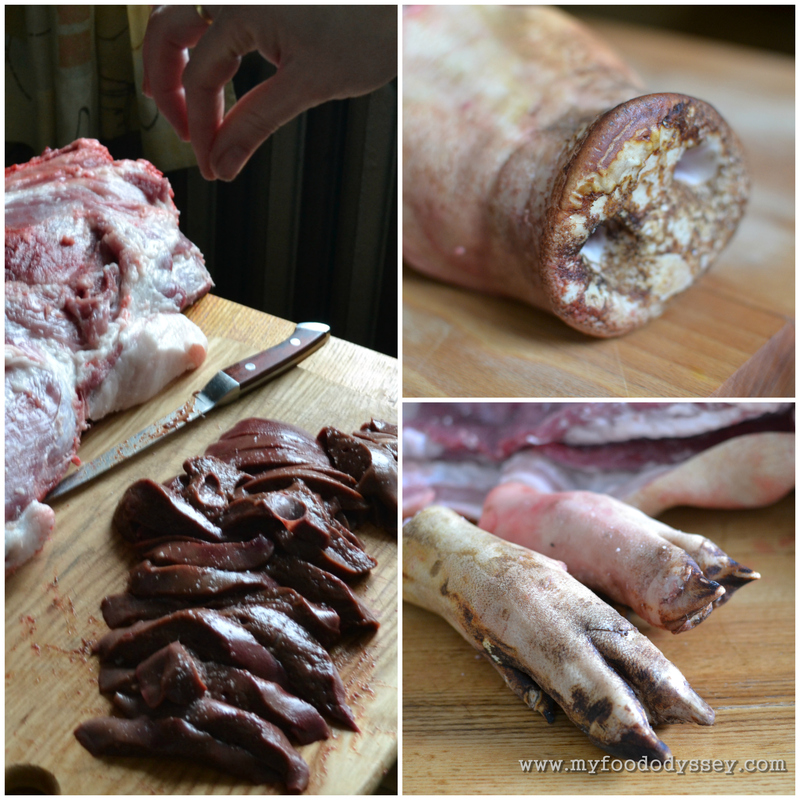 I brined the head, trotters and tail and made a delicious pressed brawn that will keep us in lunches for many days. 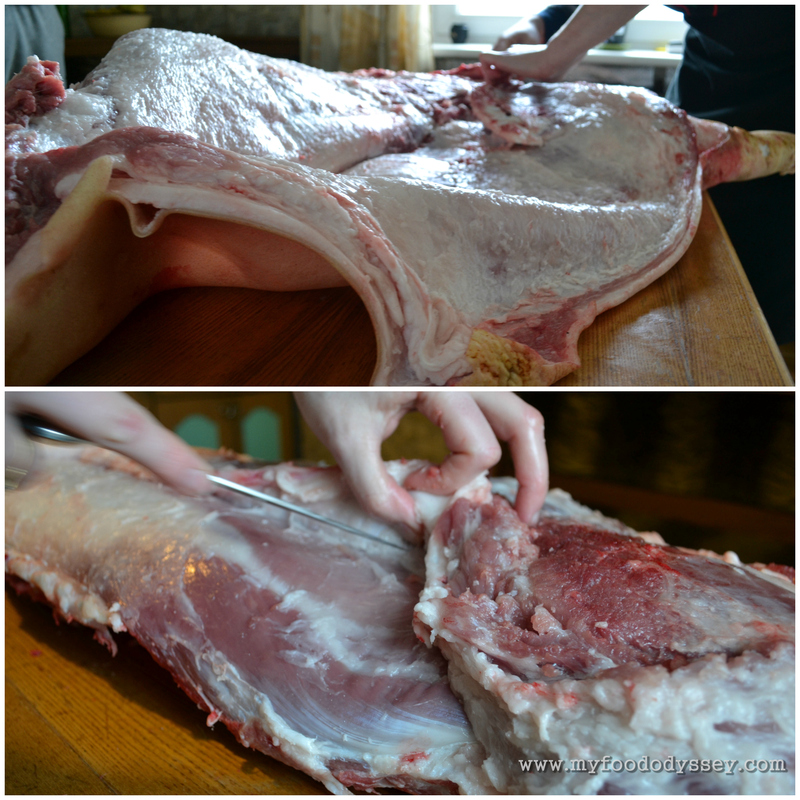 I have some belly salting for bacon – it will be ready in a few days. We have enjoyed meals with the offal and the ribs. The remainder has been cut into portions for frying, roasting or braising. 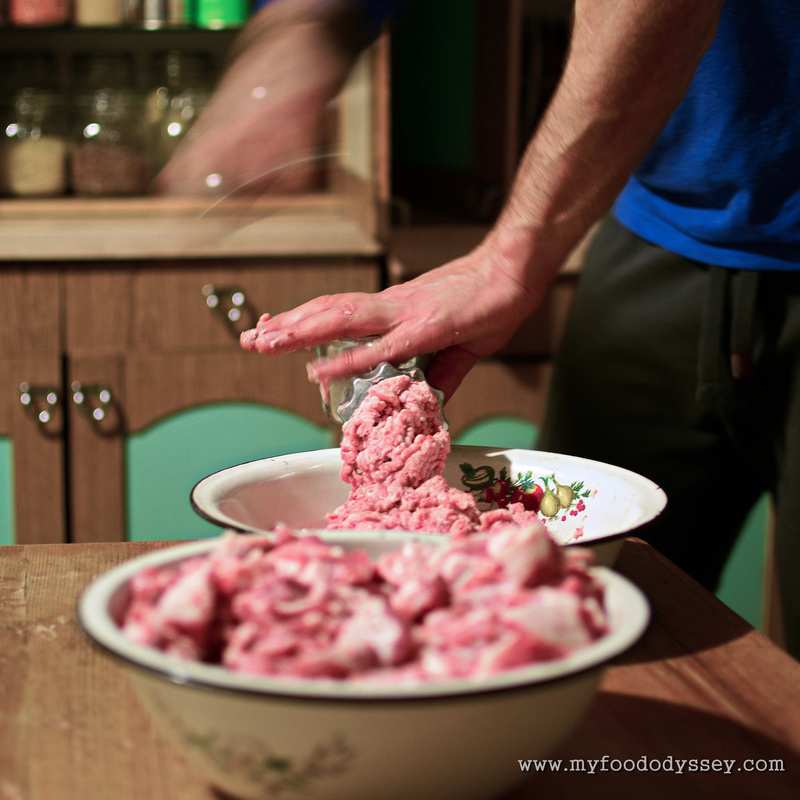 Any off cuts were ground into minced meat for burgers, sausages, lasagne and a million other uses. All were bagged, dated and frozen for future use. I am currently trying to source some lye to make soap from the remaining fat. By the time the last bag went into the freezer I was totally exhausted, but very happy with my work. I know that we will be eating organic and ethically sourced meat. I have learned a huge amount about the anatomy of a pig and what cuts come from where. While I have ended up with some cuts that would not be typical in Ireland I am happy that they suit our current needs. I may cut future pigs differently if our needs change. If I was to do one thing differently it would be to wait a day before beginning to allow the carcass to cool fully. This makes the meat easier to cut and results in cleaner lines. I had wondered why Donatas was casually drinking coffee with Arūnas and not rushing home to butcher his half – experience at work! I learned later that Donatas and his wife had butchered their half in just a few hours the following day. I think it will be a while before I can do it that quickly, but I definitely expect it to be easier next time round. In the meantime, on with the eating! Interesting experience. 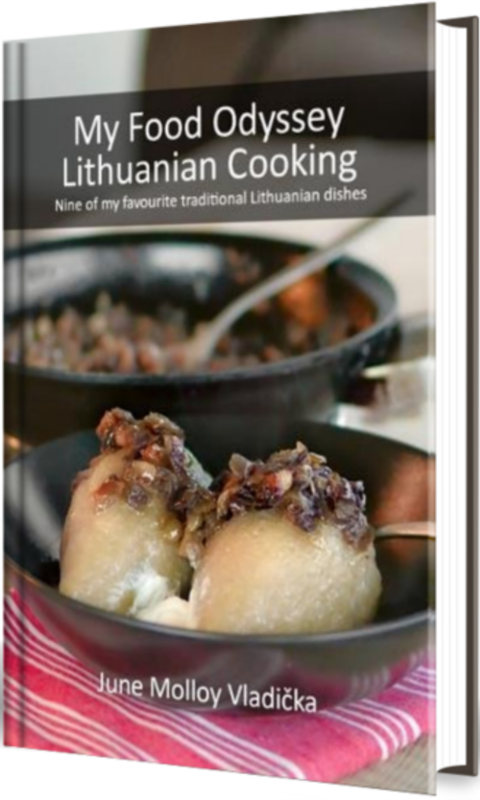 Latvia seems to be similar to Lithuania in how they butcher the pig. No skin for crackling, no meat sold on the bone, most of the fat removed and loins trimmed so much that they are virtually unrecognisable. One of the problems here is that you don’t see free range pigs as they are all kept in barns. I’m looking forward to the challenge. I’m sure you’ll do a great job of it, Andy. I found YouTube to be a great help. Just cut the joints that make sense for you and ignore local advice! Best of luck! I have been to a pork processing plant in Indiana, United States and this is a whole lot better process. I don’t know that I would be able to do it myself though since I have a hard time cutting up a whole chicken that has already been processed. I’m so glad I found your blog on House Hunters. Thanks Cindy. Yeh, we have a few friends who work in meat processing plants and it ain’t pretty. It was quite a bit of work to do the pig but it was so worth the effort. Thanks for coming to find us after seeing the show. I hope you enjoy the rest of the blog. Great post, we reared two saddlebacks for the freezer and loading them into the trailer to take to the abattoir was the most traumatic part of the whole process. We said then it would have been so much kinder to have done the deed at home. Fair play butchering them too. My husband watched our butcher do it and seemed like quite a job. Lastly well done having the courage to publish all the photos. I have a mostly veg gardening blog and upset so many people just talking online about our pigs so bottled out of printing the head boiling etc. it’s vital people know where and how their food is grown and reared. Cheers Dee! I had seen your “Do they know…” post a while back. Just revisited to see how the story ended – very entertaining! Yes, I do think it’s important that people know where their food comes from – not just meat, but all manner of food – so they can understand how the processed foods in the frozen aisle don’t bear any resemblance to the original foods. They also need to appreciate the time and effort that goes into producing good food. I tried to keep the photos as muted as possible so that people won’t be put off as I understand that even meat-eaters don’t like to be confronted with the gory details. Hopefully I got the balance right. Thanks for reading! Yes, tis funny looking back on it 😉 Your photos are great, as you’ll have seen, I bottled and passed the brawn recipe over to Margaret at Old Farm for fear of offending my readers any further. I read Margaret’s brawn post. She was braver than I and included a photo of the head. He did seem to be smiling quite contently, though. It’s funny to think that heads would have been in every butcher shop window 50 years ago but now the sight of them is considered so off-putting. They taste great, though! Cheers Lyn! Didn’t you guys ever butcher your own beef? Never! Well, we always have an animal of our own in the freezer but butchered by someone else. It was great when there were still small artisan butchers but they’ve mostly closed down because (I am told) the EU regulations were impossible for small operators to comply with. What we do now is have one of the larger operators kill and butcher the meat for us, but you never can be sure you are getting your own meat back. Ours is Hereford so it’s beautifully marbled, but some of what we’ve got back is lean and flavourless. Would you believe, the first time I ever “butchered” – well, gutted and cleaned – anything was mackerel in your house, that your dad had caught, while visiting you and Audrey when we were ten or eleven. I can’t believe you didn’t always get your own meat back. Such a shame that the small, artisan butchers are all but wiped out. Humans survived doing their thing for millennia but the EU thinks they know best. Damn shame. That’s gas about the mackerel. I cut my teeth on those fish, and on the rabbits and pheasants that dad used to catch. If nothing else it made us realise where our food actually came from – not just cellophane-wrapped packages in the supermarket! Well done – it looks great. How much more civilised than here in Ireland – wouldn’t it be great if we could butcher our own meat for our own consumption. Well done – I’ve done chickens but that is all! It is a shame that you can’t butcher your own meat in Ireland. I don’t really get it. You can catch fish and do what you like with them. You can hunt (in season) and process what you kill. But not farmyard animals. Delighted we can do it here. I once lived quite close to an intensive pig farm and so I don’t eat pork anymore if I can help it. But a free-range, happy, organic pig is quite different. Wow, I am mightily impressed at your butchering! I wish I had the bottle to do it. Thanks Mizz. I was on one of those farms once. The way the animals get treated and the amount of drugs they receive is shocking. I have some friends who work in a pork processing factory who won’t eat commercial pork. Free range and organic really is better on so many levels. Great post. We processed the last of our 3 hogs this past weekend, and it’s such a wonderful feeling to know your animal and that it was raised as a pig should be raised. We have all the traditional cuts–chops, roasts, ribs, and have jowl, bacon, ham and hocks in a brine waiting to be smoked, also plenty of sausage. It really does feel great was raised as it should be. I can’t wait to keep my own. I also can’t wait to get my cold smoker sorted – those cuts of yours sound delish! I had to scroll past most of the pictures but I really admire what you’re doing! I wouldn’t have the stomach for it! Sorry! Are you a veggie, or just not that fond of the close-ups of the meat? I tried to mute them a bit, but I couldn’t really do the post without them. Thanks for reading around them! Oh, I totally envy that you get that experience. I’m glad you’re blogging it. Thanks Stephen. Just had a quick peek at your blog. Love your “quiche” moment! A bit of this bacon would be damn tasty in a quiche. Happy cooking! Thanks a mil! I’m guessing by the time of day that you’re still state-side? Hope you’re having a great time and enjoying the sunshine.